Security is an essential element for all high-profile family, society and business affairs. 24-7 Security is an excellent choice for special events, conferences, conventions, private parties, Birthday parties, family clubs parties, charity events, business gatherings, red-carpet events and black-tie affairs. We coordinate sophisticated security operations for well-known arenas, amphitheatres, stadiums, major concert tours, high-level red carpet events, 5 star hotels and casinos, racetracks and political gatherings. A number of high profile clients in and around the East Yorkshire already benefit from our Security Service, particularly for crowd management and stewarding. Working closely with key venue personnel and the event organizers right from the earliest planning stages all the way through to the breaking down and site clearing operation after the event ensures that Site Security is managed as an integral part of the organization and the whole event runs smoothly. Our extensive experience gives us an unparalleled understanding of the sensitivity of VIP events and of the appropriate handling of specially managed VIP enclosures. High on the list of priorities for any event is Health and Safety. Working closely with government bodies, trade associations and professional agencies 24-7 Security keeps up to date with all new developments and legislation in this field. Our clients can be rest assured that their duty of care in respect of Health and Safety is exercised effectively and as discretely as possible. Our commitment to creating the safest possible environment has earned us a reputation for excellence and long-term client relationships. Our clients know they can depend on us to be proactive and highly professional. 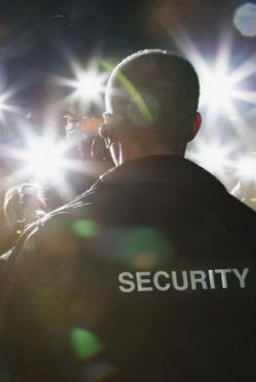 24-7 Security provides security services throughout Yorkshire, for all types of special events. When it comes to protecting individuals at special events, and guarding against theft and burglary, 24-7 security officers are at the top of their class.